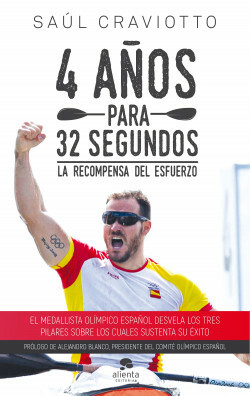 Though Saúl has an impressive physique, measuring 1’92” and weighing 98 kilograms of pure muscle, there are other kayakers with just as much strength or more, but when push comes to shove, their decisions are less efficient. What is his secret? In this book, Craviotto explains to us the bases of his training in three pillars, what he calls “the triangle of success”: Body (physical pillar), Mind (mental pillar), Relationships (social pillar). The book that will teach you to confront decisive moments: Saúl squeezes four years of work in a mere matter of seconds.